So it’s just gonna be Chris Bosh left in South Beach then? MIAMI HEAT STAR Dwyane Wade will join LeBron James on the NBA free agent market after informing the team on Saturday that he’ll opt out of his contract. Heat President Pat Riley expressed optimism that the team would be able to retain the services of seven-time All-Star Wade, as well as keeping 11-year Heat veteran Udonis Haslem, who elected not to exercise his player option to stay with the team and also becomes a free agent. “Today we were notified of Dwyane’s intention to opt-out of his contract and Udonis’ intention to not opt into his contract, making both players free agents,” Riley said in a statement. “Dwyane has been the cornerstone of our organization for over a decade, and we hope he remains a part of the Heat family for life. Wade is opting out of two years and $41.8 million left on his contract. US media reported that Chris Bosh, the third unit with James and Wade of Miami’s “Big Three” trio of stars, would also opt out of the final two years of his contract. Bosh is apparently willing to take a pay cut from what he was owed next year so that Miami can bolster a team that was dominated by the San Antonio Spurs in the NBA championship series this month. If Wade and James are also willing to accept pay cuts, Miami could look at adding a proven free agent from outside. On Thursday, the Heat apparently hoped to appeal to James when they put together a draft-day trade to acquire the rights to collegiate star Shabazz Napier. Napier was touted by James this year as the country’s top college point guard, and while James was already heading into free agency by draft day, Napier said he hoped he’d get a chance to team with “King” James in Miami. “I don’t know if I’m bringing him back,” Napier said. “I would love it. … I’ve been to his camps. Me and him chatted a few times at his camps. He’s just a special thing. The Heat reached the NBA finals in each of James’ four seasons with the club, winning back-to-back titles in 2012 and 2013 before the Spurs denied their three-peat bid. On Tuesday James said he would opt out of his contract, which would allow him to test free agency starting on July 1. But the move does not prevent James or the others from re-signing with the Heat. Email “Miami Heat's Wade joins LeBron James on free agent market”. 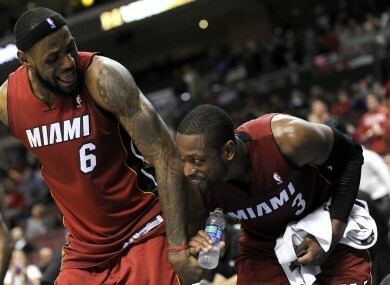 Feedback on “Miami Heat's Wade joins LeBron James on free agent market”.